"You're here early!” Ephraim “Effie” Ben Matityau exclaims as he enters the room where his interview is to take place. Though early, he is ready: all dressed up and dapper in a cream-coloured barong Tagalog with a big smile on his friendly face. While very professional, he cannot help but dote over four-month-old Michael, his first grandson, who is visiting from Germany with his family. 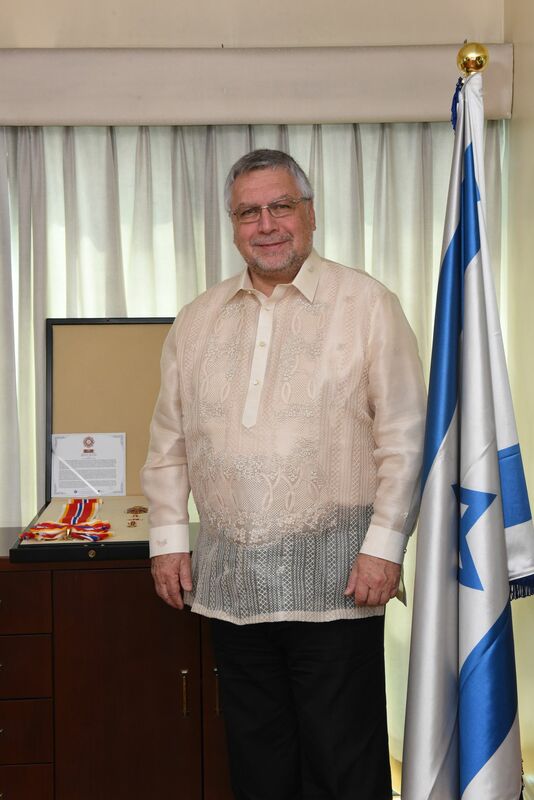 Indeed, as he nears the end of tour of duty, the Israel Ambassador exudes a relaxed aura and a jovial vitality—qualities that endeared him to many people during his tenure in the Philippines. But he is quick to say that warmth begets warmth, and that his earliest impressions of the Filipino people have helped mould his own cordiality towards them. This keen sense of friendliness has left a lasting impression on Ben Matityau, one that he feels will linger with him long after he leaves the country. It is a lesson that he began learning well before he took on the ambassadorial position in 2014. Prior to becoming Israel’s official envoy to the Philippines, Ben Matityau had been coming to the country for quite a while in his capacity as the Head of the Overseas Development Projects and Public-Private Partnership Bureau of MASHAV, Israel’s Agency for International Development Cooperation between 2009 and 2014. The Philippines and Israel enjoy a dynamic relationship when it comes to economic and industrial development. Today, there are over 30,000 Filipinos working in Israel, constituting a great part of its foreign workforce. Likewise, bilateral trade between the Philippines and Israel has grown exponentially over the past few years. As of the end of 2017, Philippine merchandise exports to Israel have been valued at US$ 63.3 million. Last 17 August, a Lighthouse Project in urban agriculture in the form of hydroponics and aquaponics was formally inaugurated on the rooftop of the Taguig City University as a way of promoting self-reliance. The Israeli government and private sector are also working with their local counterparts for programmes related to livelihood development and industry-specific skills training. But, as hard as it is to imagine, this fruitful partnership began on the eve of one of the darkest chapters in human history. Along with the 70th anniversary of the founding of the modern state of Israel, 2018 marks 60 years of diplomatic relations between the Philippines and Israel. President Rodrigo Duterte’s recent state visit to Israel served to further strengthen this longstanding relationship. For his part, Ben Matityau has worked to remind Filipinos of a great deed that happened before that, when the Philippine government brought in over 1,300 German Jews in 1937. The engineer of that mammoth rescue effort was then-President Manuel L Quezon. But laughter aside, Ben Matityau has ensured that this act of compassion will never be forgotten. In 2017, the Israeli Embassy sponsored the publication of Open Doors, Open Heart, a graphic novel penned by Sarge Lacuesta and drawn by Jim Jimenez, telling the story of the Jews’ journey to the Philippines. As one of his final acts as ambassad or, he formally unveiled a historical marker at the Philippine-Israel Friendship Park last 19 August. This dedication to fostering warm, cordial, and mutually beneficial relations between his country and the Philippines lies at the cor e of Ben Matityau’s career. For him, a diplomat works on a “win-win” principle: that all initiatives should benefit both sides. This is seen in the way his embassy here continues to push for tourism, economic cooperation, and industrial knowledge sharing. Perhaps this is his own way of pushing for better understanding and human relations.